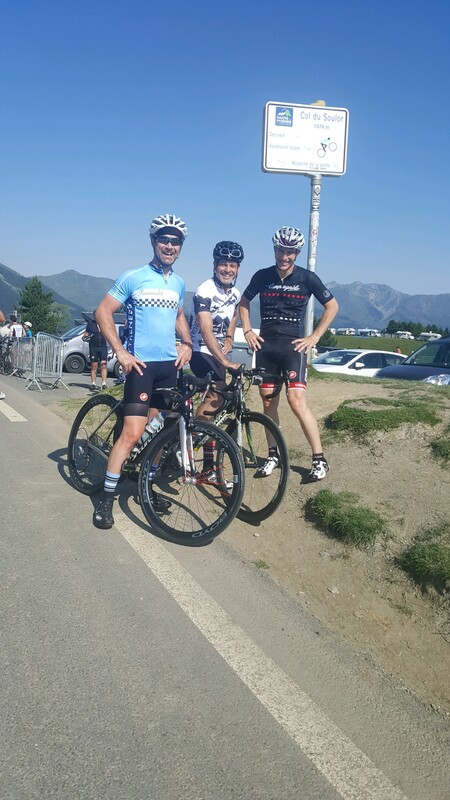 Thursday we rode much of Friday's Tour de France stage, up to the beautiful Col d'Aubisque via the Col des Borderes. After descending the "driveway" we turned left onto the main road down the valley and for the next 32 miles we followed the Tour de France route through the quaint town of Argeles Gazost, up and over the Col des Borderes, up and over the Col du Solour, across a spectacular balcony road, and up the Col d'Aubisque. The balcony road is another engineering marvel, a narrow road cut into a vertical cliff known as the Cirque du Lutor. Of all the places we've ridden the Col du Solour and the Col d'Aubisque may be the most stunning, surrounded by steep jagged cliffs. 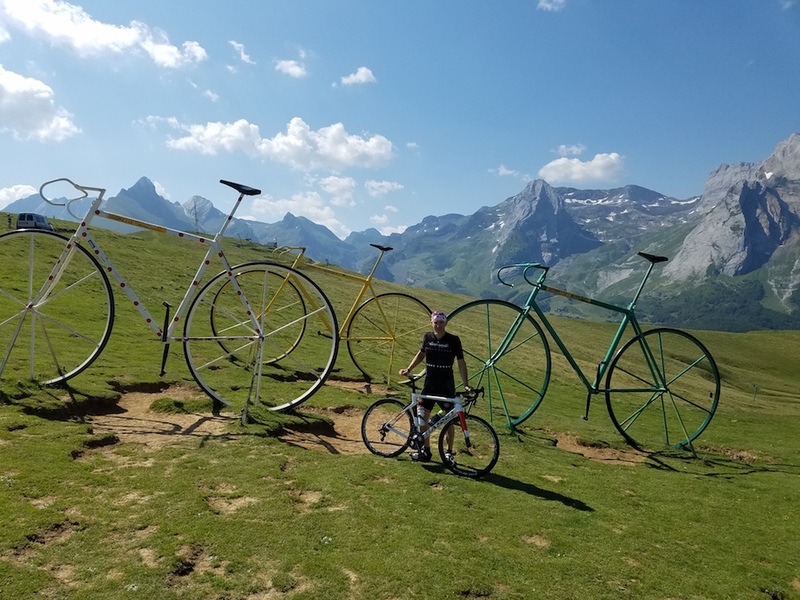 After admiring the views of the Col d'Aubisque we descended back to Argeles Gazost where we ate lunch (one of the best ham and cheese sandwiches ever), and then climbed back up to our village and gite, All in all we climbed 7,684 vertical feet in 61.5 miles! Tomorrow we'll watch the Tour live . . . can't wait! Au revoir for now. I remember that road...the balcony road and shear cliffs were stunning - in the fog none less....no time to take your eye off the road - or opps - maybe off the road you go. And a RV that was bothering i(mpeding) Filipe’s and I descent in fact got stuck in one of the rock tunnels because - oops - his RV wouldn’t quite fit through the cut-out rock haha! We had to stop and help guide him out of his being stuck against the rock haha - true story! Pics - the cycling sculptures at the summit?